Recent evidence shows that a surprisingly high portion of vulnerabilities incorporated into malware or exploit kits are ranked low or medium severity. Counter to commonly-accepted practices, focusing only on high-severity vulnerabilities and setting a ‘cut-off’ point for lower scored issues, is not a safe or effective strategy. More importantly, proof-of-concept (POC) code for lower priority vulnerabilities is appearing more quickly after 0-day announcement leading to leading to widespread attacks equally as quickly. 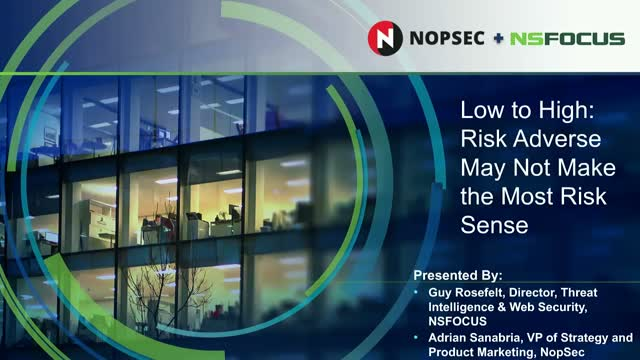 NSFOCUS and Nopsec will delve into this recent trend, discuss some of these lower level vulnerabilities being quickly exploited, and provide some thoughts how to better protect against these in the future. NSFOCUS Security Labs research has seen a dramatic decrease in DDoS attacks between 2017 and 2018. We are in consensus with other TI vendors as to most of the driving factors behind this large scale reduction, except one. This webinar will show why NSFOCUS is breaking from the pack on one of the key factors leading to the significant decrease in DDoS attacks in 2018. Over the last few years, container technology has grown rapidly among many enterprises from large to small. According to the RightScale 2018 State of the Cloud Report, over 50% of the enterprises has now adopted some kinds of container technologies. As with any other new technologies, containers have brought new security risks into those organizations’ infrastructure. What are these new risks, and how to asses and mitigate them have become some of the important questions in many of CIO and CISO’s mind. Recently, NSFOCUS and NeuVector jointly published the “2018 NSFOCUS Technical Report of Container Security” to address these questions. In this webinar, we will discuss some of the highlights from this report, focusing on the new attack vectors introduced by the container technology and the general way to protect against them. We will also discuss how to build security into your pipeline and introduce NeuVector’s run-time contain security solution. NSFOCUS showed in our “2018 H1 Cybersecurity Insights” report that "Recidivists are responsible for 40% of the attacks we saw on the internet, most of which are botnet activities and DDoS attacks". Since botnet activities and DDoS attacks are usually launched from multiple sources in a collaborative way, it's not surprising to see that many of these recidivists are working together as a group in these attacks. We call these groups "IP Chain-Gangs" as most people had trouble pronouncing "recidivists”. Opening a new area of research, NSFOCUS recently published our “Behavior Analysis of IP Chain-Gangs” report documenting how, by using innovative techniques, we identify "IP Chain-Gangs" and study the behavior of the chain-gangs using DDoS attack data collected by NSFOCUS since 2017. In this webinar, we will provide insights into this intriguing new research, explaining how we identify IP Chain-Gangs, how we characterize IP Chain-Gang behavior, and how future research can be used to improve botnet and DDoS mitigation. According to observations from the NSFOCUS Threat Intelligence Center (NTI), nearly 20% of attack source IP addresses have initiated more than one type of attack. That and other attack type trends such as DDoS, malware and web intrusions are only on the rise. The NSFOCUS 2018 H1 Cybersecurity Insights Report shows how bad the threat landscape was for the first half of this year and predicts what it will be like for the remainder. This webinar shows the driving forces behind these trends and what you can do to prepare for them. Dado que los ataques dirigidos a las aplicaciones web son cada vez más frecuentes, es más importante que nunca que las organizaciones comprendan cómo protegerse contra los atacantes que apuntan a todos los niveles de la infraestructura. Los malintencionados están utilizando tecnologías, herramientas y conocimiento para explorar dónde eres más susceptible al ataque. Aunque eres susceptible de atacar, no tienes que ser vulnerable. Si usted es como la mayoría de las organizaciones, ya tiene una solución DDoS implementada, pero eso podría no ser lo suficientemente bueno. Cada vez más, los expertos recomiendan alejarse de los puntos únicos de falla, duplícalos o a veces triplicar, las soluciones de mitigación DDoS. Al adoptar una estrategia de mitigación DDoS híbrida (capacidad local y nube), las organizaciones tienen la mejor ruta hacia la resiliencia y eficiencia operativa en el evento de un ataque DDoS. • ¿Cómo estás definiendo la mitigación? • Si está utilizando una compañía de mitigación DDoS, ¿cuál es el mejor momento de mitigar? • ¿Tiene solución de nube como opción de failover? • ¿Estás haciendo todo lo que puedes para proteger a tu organización contra el próximo ataque? As attacks targeting web applications are becoming more frequent, it’s more important than ever for organizations to understand how to protect against attackers targeting all levels of the infrastructure. Attackers are using technologies, tools, and reconnaissance to scout where you are most susceptible to assault. Although you are susceptible to attack, you don’t have to be vulnerable. By adopting a two-solution DDoS mitigation strategy – employing one mitigation downstream to defend at the point of attack and the other upstream to provide protection closer to the attacker before it reaches your network – organizations have the best path to resiliency and operational efficiency in the event of a DDoS attack. •How are you defining detection? •If you’re using a DDoS mitigation company, what’s the time to mitigate? •Do you have cloud solution as failover option? •Are you doing all that you can to protect your organization against the next attack? •Survey of the exposed IoT devices. •Various vulnerabilities in these IoT devices. •Threat analysis from these IoT devices. •How to protect the IoT devices. This is an opportunity for all Fintech security professionals to take a deep dive into the current and future threats targeting the technology that drives the financial sector. •The current security posture of Fintech institutions and the security trends that they should be aware of. Reserve your seat today to learn how to better arm yourself against the next generation of threats against Fintech. Abstract: Can you afford not knowing how bad your provider's IP reputation is? How likely are IP addresses adjacent to you of being infected with malware or participating in botnets? NSFOCUS has been tracking the reputation of IP addresses globally by ASN for over a year and recently released the August 2017 Global IP Reputation report. Some interesting patterns have emerged worldwide as the number of IP addresses added to reputation lists continues to increase due to Mirai, WannaCry and other malware infecting the Internet of Things. NSFOCUS SecLab is tracking IP reputation across 9 categories, including SPAM, DDoS, botnets, and web attackers. This talk will present global IP reputation trends and rank the countries with the worst IP reputation…and it may not be China. This year the cyber-security realm has experienced a few dramatic emerging trends to include a couple of the largest denial-of-service attacks and ransomware outbreaks in history. Follow NSFOCUS as we take a deeper look into these DDoS attacks and some of the processes that now seem to be tied to the overall attack-chain. Additionally, we will learn how protective measures such as Threat Intelligence and cloud-based DDoS defenses are adding value to circumvent and mitigate attack efforts from various threat actors. The ‘Shadow Brokers’ have recently released a new cache of malware exploits into the wild in which our NSF Threat Intelligence Researchers were able to reverse engineer and ‘sandbox’ for analytical purposes. With this noted, very sophisticated malware strains developed at the ‘State-Sponsored’ level by such entities as NSA are now readily available and primarily targeting vulnerabilities identified in Microsoft OS’s and MS applications. This will be the second installment to my previous BrightTalk presentation that will take a deeper look into specific exploits released by the Shadow Brokers and their attributed TTP’s (Techniques, Tactics, Procedures) and how NSFOCUS’s Threat Intelligence can assist in securing your security posture. •What are the exploits Fuzzbunch, Dandersprit, and OddJob and their associated campaigns? •How can NSF’s Threat Intelligence Portal and Reputation Feeds protect you and your company against these recently released malwares? •Gain a better understanding of TI components to include ‘Strategic’ and ‘Tactical’ information and how knowledge of these exploits will help protect your company from future compromise. There is no doubt that DDoS attack activity is at an all-time high as attacks continue to plague the Internet; causing outages and impacting organizations on a scale never seen before. Regardless of the intent, the likelihood of larger and more frequent DDoS attacks is forcing service providers to plan for the inevitable. Most don’t realize there is a tremendous opportunity for service providers to protect their customers, and significantly profit from this activity. Delivering Managed DDoS Services can be very profitable due to the intensification of DDoS attacks, and the rising demand for protection. Nobody thought it was possible to spawn a 1Tbps+ DDoS attack by hijacking connected devices. Connected Internet of Things (IoT) devices are smart, convenient and notoriously lacking in security. IoT devices can be easily exploited due to their inherent security gaps. Soon these IoT-based attacks will become everyday occurrences for service providers and enterprises the like. Join Stephen Gates, Chief Research Intelligence Analyst at NSFOCUS, and learn about IoT-based botnets, how to detect them and how to better protect your connected devices. Richard Meeus, VP of Technology EMEA, NSFOCUS, on Responding to More Powerful Strikes. How NSFOCUS is helping global customers defend against DDoS and extortion attacks. Today’s advanced cyber threats are borderless – and so are enterprises. As enterprises are increasingly adopting cloud, the siloed defense-in-depth technologies have proven futile against today’s advanced threats and borderless trends. This webinar will address the current security strategy shortfalls and the technology that can help better protect your organization. Cyber extortion can take many forms. From ransomware and sextortion, to DDoS shakedowns, and data-dump blackmail, organizations all over the globe have been directly impacted by these campaigns in 2016. What’s changed with hackers’ tactics, techniques, and procedures, and why the sudden surge of activity this past year? What can we expect to see in 2017? Join Stephen as he exposes the reasons why this attack vector has drawn so much attention, and how it’s gained so much success. Since the primary enabler for extortion is fear, Richard will demonstrate how organizations can measure their exposure, plan for what’s coming, and take proactive steps to eliminate their fears. If the countermeasures are done right, these blackmail attempts will soon fall on deaf ears. After the Brexit of TI earlier this year, panic has subsided and cooler heads prevail. Now that we all agree Threat Intelligence can be a useful tool, you too can learn how to use TI like a pro. NSFOCUS shares real-world customer case studies and research to help their clients ensure a safer, more secure enterprise. NSFOCUS provides a Complete Service Provider DDoS Mitigation Solution that protects both customers and infrastructure; while enabling providers to deliver Managed DDoS Services with a multi-tenant Platform that produces the lowest operating costs in the industry.